Boston Bloggers: Boston Bloggers August Meet + Greet! 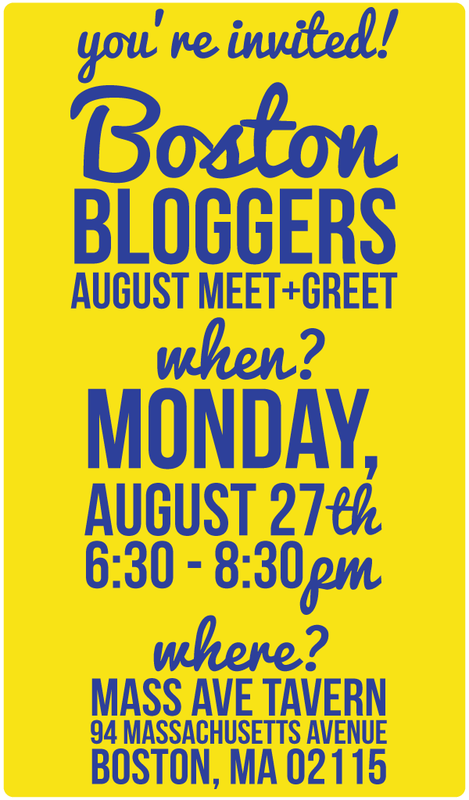 Boston Bloggers August Meet + Greet! Katy and Alison are happy to announce our August Boston Bloggers event! This meet + greet will be held at Mass Ave Tavern on Monday, August 27th from 6:30 to 8:30pm. Sadly, this will be Katy's last rodeo with the Boston Bloggers--so be sure to come and send her off in style! With your ticket purchase, you guarantee your spot at the event, where you can mix and mingle with the best of Boston's blogging community. You'll also get a handy checklist of "who's who" at the event. We hope you can make it! Your tour is always so wonderful to read! I also delight in every photo that you take. All your decor is splendid and so natural and gorgeous. Last time I’m visit write my essay helps college students to enhance traditional essay writing abilities. Other than the college syllabus, writing ability is likewise needed to broaden self-development.Thanks for joining our tour and I hope you and your family have a wonderful Christmas!